The charm of a freestanding home in the middle of New York City will never get old. This Italiante home, at 237 77th Street in the Brooklyn neighborhood of Bay Ridge, pretty much exudes all the charm and is now asking a cool $2.5 million. The 11-room house has a landscaped front yard that leads to a wrap-around porch. 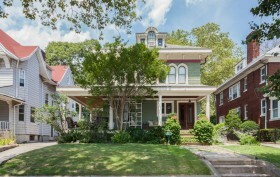 Once inside, a grand entrance leads you to a formal living room with hand-restored crown molding, the original windows, stained glass doors and a side entry back out to the porch. The rest of the house, too, is decked out with historic extravagances like stained glass, pocket doors and a wood-burning fireplace.